Helen’s father Edward Carrick designed for film and stage, her grandfather Edward Gordon Craig was a stage designer and the son of the great Victorian beauty Dame Ellen Terry, the leading Shakespearean actress of her day. Despite her love of drawing Helen felt overwhelmed by the wealth of talent around her and didn’t pursue it as a career, instead becoming an apprentice in a photography studio; eventually setting up her own portrait studio. However she did learn a lot from her father and attended evening classes at the Central School for Art where she was taught by the great illustrator Mervyn Peake. It wasn’t until she bought her small son, Ben a copy of Maurice Sendak’s ‘Where the Wild Things Are’, that she found the inspiration and determination to experiment with illustration. The first book she illustrated was ‘Wishing Gold’ by Robert Nye in 1970, since then she has illustrated over 60 children’s books including ‘This is Bear’ series, written by Sarah Hayes and ‘The Town Mouse and The Country Mouse’ which was short listed for the prestigious Smarties Book Award, and of course, the hugely successful ‘Angelina Ballerina’ series of books written by Katharine Holabird. The Angelina books have been translated into over 15 languages as well as been made into an enormously successful animated series and an original ballet by English National Ballet. 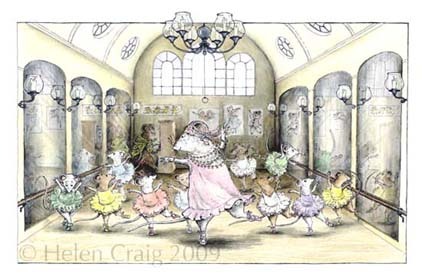 It was Helen who when approached to illustrate the ‘Angelina’ books, suggested that Angelina should be a mouse, a creature that can mimic human postures and emotions. A very astute suggestion cleverly creating a character which transcends all cultures and contributing to the international success it is today. Helen likes to be closely involved in the development of new books making suggestions for scenes that will create successful illustrations. Each ‘Angelina’ book takes about nine months to illustrate and there are currently 13 in the series with more to come.